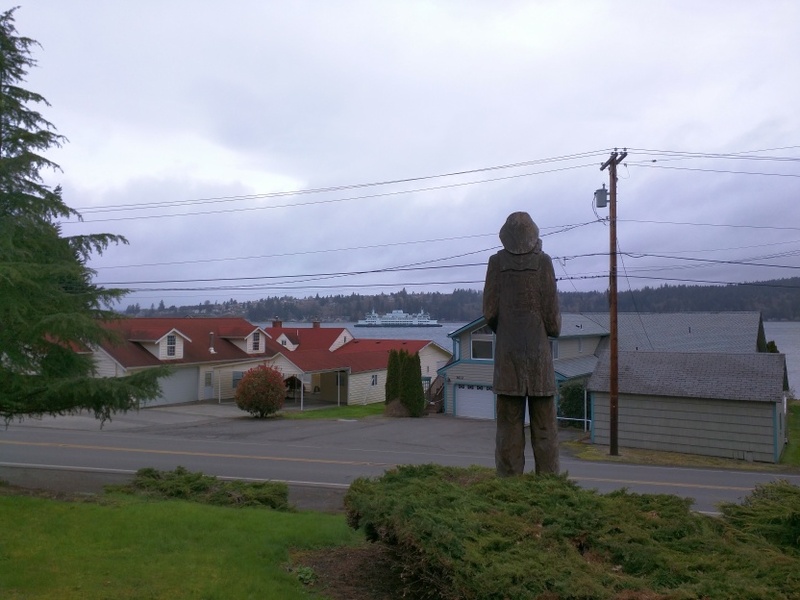 I recently spent about a month on the Kitsap peninsula across Puget Sound from Seattle. During my stay, I drove up and down Beach Drive through the area called Waterman many times. I could say because of the scenic views of the water and mountains to the west, it took a little while before I noticed this large statue along the way, but the fact is I noticed the statue nearly the first time, but took a little while before I stopped to take a closer look. Additional information on the statue's history has eluded me, but I found it to be an interesting and unusual sight to see, and maybe you will too. To log this find, please upload a picture of yourself, the statue, or a view from the location, and use the 2 digit number seen beneath the statue's right heel as the logging code. Please park in one of the convenient pullouts along Beach Drive or Hillcrest Drive, and don't disturb the residents. Searching only in daytime is strongly suggested.